The family of former Penn State football coach Joe Paterno says the lung cancer with which he has been diagnosed is a "treatable form" -- though statistics suggest that even in the best of circumstances, the disease poses a serious threat. "Last weekend my father was diagnosed with a treatable form of lung cancer during a follow-up visit for a bronchial illness," Paterno's son, Scott Paterno, said in a statement issued Friday. "He is currently undergoing treatment and his doctors are optimistic that he will make a full recovery." Later, another Paterno son, Jay Paterno, an assistant Penn State football coach, added in an interview with ESPN's Tom Rinaldi, "If there's one guy I know that can beat that, it's him." Last week, Penn State's board of trustees fired Paterno, the winningest coach in the history of NCAA Division 1 football, in the wake of a sexual abuse scandal surrounding his defensive coordinator, Jerry Sandusky. 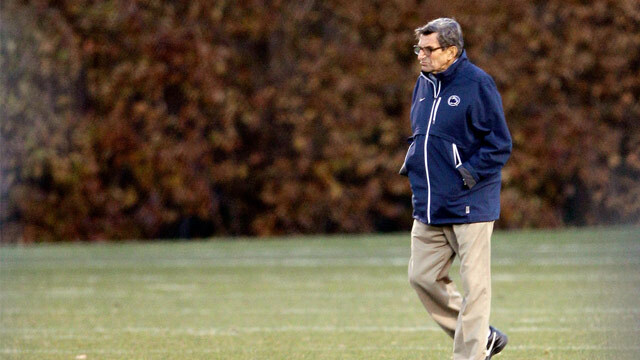 Paterno, considered a legend by many tied to the school, has been embroiled in the scandal based on suggestions that he knew of Sandusky's alleged behavior and failed to do what was necessary to properly report it. Upon learning of Paterno's diagnosis, Dave Joyner, Penn State's acting director of athletics said in a statement, "Joe Paterno and his family are in our thoughts and prayers. Anyone who has ever been around Coach Paterno knows he has tremendous drive and fight. The Penn State community will be in his corner and wishes him a speedy recovery." Jay Paterno said his father has been focused on his health issues for the past week rather than the scandal swirling around Penn State football, and didn't even watch a controversial TV interview Sandusky gave several days ago. But his reaction to his diagnosis was to tell his son not to worry. "He just waved me off," Jay Paterno told ESPN. "He said, 'Don't bug me about that. I'll be fine. You worry about coaching the football team. ... You worry about the game next week, and don't worry about me.' Every day I've gone by the house to bug him and he says the same thing. He has a tendency to minimize things, but he's going to be fine." The suggestion that Paterno will make a full recovery suggests the cancer was caught in its early stages before it had a chance to spread. "All stages of lung cancer are treatable," said Dr. Martin Edelman, director of medical thoracic oncology at the University of Maryland Greenebaum Cancer Center. Stages I through III are curable, he said. And treatment for stage IV lung cancer can prolong survival and improve the quality of life. According to statistics from the National Cancer Institute, 52.5 percent of patients whose lung cancer is detected before it has spread are alive five years after it is found. But only 15 percent of patients are lucky enough to have their cancer detected this early -- and the numbers drop precipitously from there. For the 22 percent of patients whose cancer is only detected after it has spread to the lymph nodes, the chance of being alive five years later is 24.3 percent. And for the 56 percent whose cancer has metastasized, the 5-year survival rate is only 3.6 percent. The numbers may sound grim. But the proportion of lung cancer patients who survive five years has doubled in the last 20 years thanks to improved treatments, according to Dr. Fadlo Khuri, deputy director of the Winship Cancer Institute at Emory University School of Medicine. Lung cancer treatment can involve surgery, radiation, chemotherapy or a combination of all three. Older patients like 84-year-old Paterno may struggle with side effects more than their younger counterparts. But as long as they're in good shape, they can handle and benefit from even aggressive therapy. "While age is a factor, it is far from the most important factor," said Khuri. "The more robust the patient, the better they will tolerate the treatment and the more likely they are to benefit from it." To catch cancer before the most aggressive course of therapy is needed, 20 of the nation's top medical centers are setting up lung cancer screening programs using computerized tomography, or CT. Through these programs, patients considered to be at high risk of lung cancer can be screened, hopefully allowing doctors to detect their disease as early as possible, before it has a chance to spread. The approach just might work, at least according to research released in June and published in the New England Journal of Medicine. The results of the seven-year study offer the first solid evidence that screening with CT scans could reduce lung cancer deaths by as much as 20 percent in high-risk groups, such as heavy smokers older than 55. Another important factor in the survivability of lung cancer is whether the cancer is classified as "small cell" or "non-small cell." Of these, small cell is the more aggressive. According to NCI data, patients who are diagnosed with non-small cell lung cancer tend to have a better chance of survival, at least when the cancer is caught in its earlier stages. In this area, the numbers are slightly more forgiving: Only about 15 percent of the estimated 221,130 Americans who will be diagnosed with lung cancer this year will have the small cell variety, according to the National Institutes of Health.